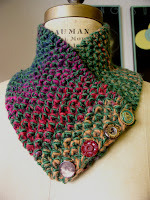 Lorrie knits and sews: Knit a Mile from Stash? Knit a Mile from Stash? I've taken up a Ravelry challenge to knit a mile from stash in the next 6 weeks. I'm ready. I've weighed all the remaining yarn in my ongoing projects and figured the yards/ounce which is unknit. When I finish the project, I'll weigh the remains and subtract. Someone figured that at 200 yds for a sock, 4 pairs would meet the challenge. That sounds doable. I do have a couple of other things in minds also. I've started the January mystery sock and finished clue 1 for one sock. 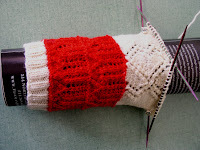 I've almost finished the red part for the 2nd sock. Socks for John are almost to the heel, just a plain 2x2 ribbing. I finished Peg's Fidget. I'll give it to her tomorrow morning when we meet for breakfast. Soon I won't be able to talk about gifts. I'm telling the whole family about the blog and many of them will look in. Maybe I'll talk about the knitting and not identify the recipient. As usual, I had to work today. I get Thursdays off. I'm home all evening, so lots of knitting time. We're having roast beef has for dinner, to use up the end of a small roast. There are only two of us so it doesn't pay to cook a lot of meat. I do still make big pots of things and freeze the remains in one or two person servings. Your Fidget is lovely! What is the yarn? Is it Spring in January?